During dry ice blasting, high-density CO2 pellets are propelled through high-velocity air stream, making most contaminants brittle and causing them to contract and break away from surface. 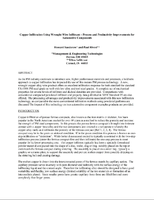 Propellant then whisks away contaminants. In combination with high-velocity air streams, MoleÂ·Master employs interchangeable nozzles to provide maximum aggression and flexibility. 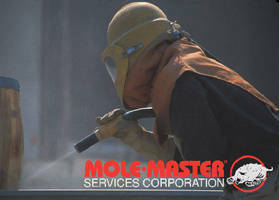 Dry ice blasting is non-abrasive, non-conductive, non-toxic, and compliant with EPA, USDA, and FDA guidelines. 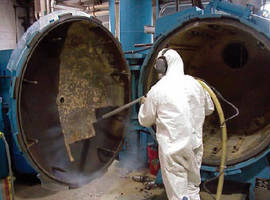 MARIETTA, OH -- Mole·Master(TM) Services Corporation is now offering dry ice blasting as part of its stable of silo and bin cleaning and abrasive blasting services. "Tremendous advances in engineering enable us to provide dry ice blasting that offers major reductions in set-up time and production downtime," Mole·Master General Manager Dave Laing said, "The overall impact on a customer's day-to-day operations is minimal." 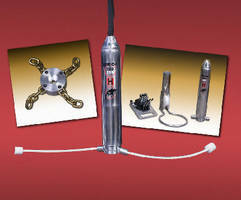 In dry ice blasting, high-density CO2 pellets are propelled through a high-velocity air stream. The pellets make most contaminants brittle, causing them to contract and break away from the surface. The propellant then whisks away the contaminant. "For more viscous contaminants, the pellets flush the contaminant, much like high pressure water but without the rinse water containment and disposal problems," Laing said. In combination with high-velocity air streams, Mole·Master employs interchangeable nozzles to provide the maximum possible aggression and flexibility for a wide range of cleaning requirements. 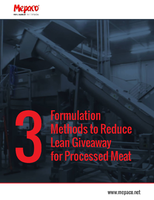 "Furthermore, the process creates no secondary waste," he said. Celebrating over a quarter century of service, Ohio-based Mole·Master is a leader in media blasting and dry ice pellet blasting, as well as the manufacture and distribution of bin and silo cleaning equipment. 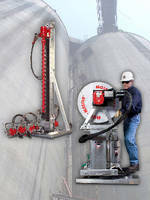 Silo and Bin Cleaning System offers hydraulic cutting head.